In the middle of last month, Comixtalk invited people to tell them about their decade in comics. It has been somewhat popular with the big names in the world of webcomics and since I’ve been around for quite a while too, I thought I would put up a post about my own decade on the sidelines of this burgeoning industry of ours. Given that I’ve been doing web comics for a little longer than a decade, I’ll start with a prologue covering that initial period a bit more. Bear with me, please? I started making comics when I was a kid, back in the 1980s, but I’ll not bore you with all that. Suffice to say I produced a lot of ‘comics’ that were barely more than poor crayon drawings on sheets of A4 paper, folded down the middle so they formed a booklet. I doubt any of these still exist and that’s probably a good thing because I could neither draw nor spell back then. I was a big fan of The Dandy and The Beano as a kid and I remember pouring over each issue of the comic, obsessed with the detail in some of the artwork; especially the black-and-white art that made up for a lack of bright colours with some intense detail and shading work. That was when I caught the comics bug. I’ve been making my own comics since. In the early 1990’s, I moved over into fanzine production rather than straight-up comics but even then I filled the pages with drawings and doodles; mostly in place of actual screenshots when reviewing 8-bit computer games and the like. I produced comics and fanzines for years through my own small press outfit, ‘Reality’ Entertainment (the quotation marks were part of the name. How pretentious is that? Still, I was twelve and I’d like to think I’ve learned from the experience). My first comics outside of my own very limited runs (which were printed by my father, on a photocopier at his workplace) appeared in print courtesy of KJC Games, a play-by-mail company running a fantasy game called Quest. I think it’s still running. I submitted Portly Stoutmaster’s Journeys to the editor of The Demon By The Campfire and he liked it enough to publish it in the newsletter for the particular game of Quest that I played in (I think it was game 6 of the 15 that were running at the time). Later, I took over as editor of The Demon By The Campfire and published it until the game was merged with another game; at which point I stepped down. I was running my own play-by-mail company by that time and needed to spend more time on my own business (it didn’t last. I didn’t see World of Warcraft coming. To be fair, I don’t think anyone in PBM gaming saw WoW coming or what effect it might have had. I’d like to think I’ve learned my lesson from that, too – don’t focus only on what you think your market is, look at what your audience thinks your market is, because the companies running in those other areas are going to be big competitors). Anyway, let’s get back to the story. It continues at a time when me closing shop on my PBM venture was still some way off. Portly Stoutmaster was a reasonable success in the sense that I achieved the goals I was aiming for: get myself in print courtesy of someone else. I decided that Portly and friends didn’t have the staying power I needed for an ongoing comic however, so I went back to the drawing board for my next venture. I began thinking about characters I’d created when I was a lot younger, something like seven or eight years old. These guys were fun: they were bright; they were lively; and they had been on all kinds of wacky adventures, both in my imagination and in computer games (mostly text adventures) I had programmed about them. They were Nob Mouse and friends. You may recognise them from such websites as this one, which you are reading right now (unless you got this through the RSS feed or something). I always tell people the first episodes of The Life of Nob T. Mouse were produced because I was bored during revision for physics exams and it’s true. However, I had been planning a new comic for a few months before I put pencil to paper, so the full story is a bit longer. I wanted to make a new comic. I thought Nob Mouse was a good character to centre the comic on. I just didn’t know how to actually produce the damn thing. That came to me during my physics revision, when I was dealing with very basic ideas about quantum physics (I was studying A-Level Physics at the time). So, in December 1996, while revising for my exams (which were modular and therefore cropped up every term for two years), I created the first three episodes of The Life of Nob T. Mouse. My parents were non-plussed (they still don’t understand it) but I liked it and I wanted to put it on the Internet so my aunt and uncle, who lived in Germany at the time, could see it. Back in 1996, the concept of webcomics was not really something that had fully coalesced. There were comics on the web but they were few and far between compared to now. I hadn’t heard of the term before, if truth be told, and I didn’t really care if other people were doing this or not. All I knew was that I wanted to put my comics online; so I did. They originally sat on some free web space a school friend had been given by his ISP but when he needed that space (which was only about 10 megabytes at the time) for his own projects, I got myself an account with Tripod. The account is still there. I’ve long since forgotten the login details however and it hasn’t been updated since before I bought Nobmouse.net as a domain name. So for the next few years I produced comics, stories and a few computer games about Nob Mouse and friends. I also produced a slew of other comic characters along the way, such as Colin Cleft: Space Bloke, but none of these stood the test of time. Maybe one day I’ll go back and see if I can make something of them, but not right now. The Life of Nob T. Mouse entered a hiatus of sorts in mid 1999 thanks to the fact that I started university and had a lot more work to do than before. I continued to write Nob Mouse stories and the earliest drafts of Pie Noon stem from this time, but unfortunately I’ve lost the majority of what I produced and they never got to see the light of day online. It’s a shame really, I think some of those comics would be quite good to put up on the site. If only I could remember them. I also began writing a comic with a school friend, Ben Taylorson; who I think is now a librarian but I’ve not seen him in years. The idea was to try to pitch it to 2000AD but we could never work out the kinks in the storyline. I eventually took the parts of the story that I’d put together and wrote a novella based on it, called Unholy Crusade. The fact that the story is haphazard and doesn’t really go anywhere should give you an indication of just how many problems there were with it right from the start. It could probably be rescued and made into something worth reading but I have too much work on right now. Later on in the early 2000’s, I started chatting with PJ Holden on the usenet group alt.comics.2000ad. He was interested in starting up a thing called “shareware comics” with a view to helping more people get into the small press comics scene. The scene has become really closed-off over the years and I think he was wanting to bring in some new blood to help rejuvenate it (at least, that’s what I was thinking this project was for). We all put some of our comic projects into a giant “shareware comics” pot and then editors of small press magazines could fill out their pages with our comics, so they could keep producing magazines and the like even when there was limited work of their own to draw on. I submitted some on The Life of Nob T. Mouse and a new project I had been working on, called World Powers. World Powers was my first foray into the superhero genre. I created a few people from around the world who all worked together in a Justice League style of venture, in addition to protecting their own regions and interests. The project was far too big for the limited time I had spare to actually work on it (I was in my third year of university and my chronic illness had just started to manifest itself). Although I produced about three or four pages of the project, it died through sheer lack of time. In 2004, I had settled into a boring job with the Civil Service and started having the time to work on projects again. I had continued to draw one-panel joke comics and design characters since I left university in 2002 but I never really stuck it out with a proper project. I wanted to get back into drawing The Life of Nob T. Mouse on a regular basis but getting the right storyline for the comeback was proving very elusive and as time went on, I felt this overwhelming need to get the story “just right” or coming back for more would ruin what had already been done. So I started on a new project. At university, I had been heavily into Live Action Role Playing via Durham University Treasure Trap and as a final goodbye to the society when I left university, I had run their 20th anniversary big adventure as a sort of Crisis on Infinite Earths; completely rewriting the setting so it was no longer bogged down with decades’ worth of continuity. I decided a comic based on what my friends and I had put together for this retcon would make an enjoyable read. That project never saw the light of day. I started getting bogged down in so much backstory, which all had to be summarised if the comic was to make sense. In the end, just explaining what had gone before was going to take more time and effort than the narrative of how we had wiped the slate clean. It felt like an exercise in futility, so I dropped it. The idea of a live action fantasy role playing comic stuck with me however, and I began talking to some fellow LARPers about a new LARP comic, called Dudes With Swords. I designed a group of four characters, based on the stereotypes my friends and I had encountered during our LARP careers, and put together an opening storyline (Yay, though I walk through the valley of the dead I shall fear no evil, for I have Stoneskin) but when I began drawing the strip, my friends all got jobs or moved away and we lost touch. The project fell apart, which is a shame because I think it was a really good idea. I’ve tried to resurrect it over the years but if I want to use the portions of the comic that my friends added, I really need to get their permission. Sadly, that seems unlikely. If I do resurrect the project, it will have to be based on my own work, I suppose. Then I met my wife to be, Jennifer. She thought my constant talk of bringing back The Life of Nob T. Mouse was very annoying and confronted me with an ultimatum: either draw the bloody comic or shut up about it. I didn’t want to shut up about it, so I started to draw it again. It was her that helped me overcome the stupid idea that making new work in the same universe would damage the older work if the new stuff wasn’t the same. Looking back, it’s fairly obvious to see that the new stuff could never be the same as the old stuff. I’m a different person now (in more ways than one, some would say) so what I produce is never going to be the same as what the angst-ridden teenage version of me produced. It was time to just bite the bullet and get back into the webcomic game proper. To say I never looked back would be an understatement. I never looked back, forward, sideways, up or down. I just stuck a pencil in my hand and got sketching and to hell with the consequences. Pie Noon marked my return to firing my creations off into the great, wide world without a care for what people thought about it and consequently, it was the first project in years that actually got finished. I wasn’t without its setbacks, as can be seen from the apology entries in the archives, but it did get the ball rolling again. Turns out it wasn’t a normal ball though, it was one of those sticky balls that picks up more and more stuff as it goes, eventually becoming a world-destroying black hole from which matter can never escape. Making one webcomic was soon not enough. I roped Jenny into helping me create Nob Mouse comics fairly early on in the return to regular production and we then got talking about making another webcomic; something completely different. Enter All over the house, the story of a cynical journalist who can’t stand the state of the modern world and her crazy housemate, who practices demonology when she isn’t practicing law. Despite still having wholly crazy backgrounds and origins for the characters, All over the house is my most successful project to date. I then went on to start up The Webcomic Builder, a website devoted to talking about the tools of the webcomic trade and helping new people get into webcomics; while also hopefully providing some information the old hands will also find useful. After that, The Webcomics Company podcast emerged as another project. That has been great fun and I hope it continues long into the future. 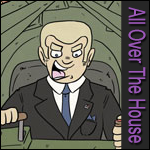 It does some things The Webcomic Builder does, but in audio form and also provides a nice bit of community chatter which I think people have appreciated. So what’s next? Well, I have another set of projects coming next year. 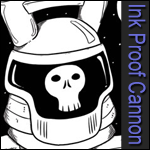 In January 2011, Ink Proof Cannon will launch. This will be an anthology webcomic, running five different strips a week (one strip updating each day, Monday to Friday). I’m writing all five strips and drawing four of them. I met a brilliant artist called John Ashworth at a party once and he was so talented that I immediately said “hey, we have to do a comic together” despite not having any real idea what the comic would be about. He’s great with spaceships, we’re working on a space saga called Sol Invictus. It’s very Roman in its theme and I think it will work very well. So there you have it. One long story about a daft woman’s attempts to draw pictures. What’s your decade in comics been like? Over on the New Scientist website, doedfisk (which I believe translates as “dead fish” in most Scandinavian languages) gained him or herself the title of Internet Hero by asking what height above the Earth’s surface a turkey must be dropped from in order for it to cook nicely on re-entry. We thought this was the kind of question that just had to be put to Spam and Wilf. Spam suggested that the issue is not so much the height as the speed at which the turkey is launched, since it is not the altitude that causes the cooking but the friction generated by air passing across the surface of the turkey. Consequently, you need the turkey to be moving at a relatively high speed in order to generate sufficient friction. However, you can’t make it go too fast or the surface will burn off. Ever seen the size of a meteorite when it lands on the ground? It’s a lot smaller than the original meteor. Wilf suggests you will be wanting to actually eat this turkey when it lands, so reaching a stable velocity where the temperature is high enough to induce cooking will be a necessity, too. Finally, there’s the biggest problem at all: cooking time. If we take a 10lb turkey, we are looking at approximately four hours’ of cooking time, according to The Science of Cooking website. Unless we’re firing this turkey at an angle, that means dropping it from a significant height. Remember that we can’t get it over terminal velocity just by dropping it and that’s not really going to cut the mustard when it comes to getting the right temperature through friction. However, we can’t go into high orbit because without air, the turkey will simply accelerate due to gravity and end up going too fast when it hits the atmosphere. Spam went on with his discussions for quite some time but Wilf had a better plan. Given that it takes a considerable amount of energy to get the turkey to the right height and speed in order to cook it, why not save all that time and quite a significant portion of that energy by simply putting the turkey in the oven like a normal person?